Burt's Bees Lemon Butter Cuticle Cream is 95 per cent natural and provides intensive care for dry cuticles, brittle nails and chapped, cracked fingertips. Burt's Bees Lemon Butter Cuticle Cream contains sweet almond oil, cocoa butter and lemon oil to moisturise the cuticles and leave them soft and healthy. Vitamin E and rosemary leaf oil help condition the skin assist with its repair while beeswax helps to seal in moisture, protecting the cuticles and nails from drying out. It has a wonderfully refreshing lemon scent. The steel container is recyclable. To use, massage into and around nails at least twice a day. I never thought moisturing your cuticles was a thing until someone gifted me the Burt's Bees Lemon Butter Cuticle Creme and now I am converted :). I love Burt's Bees range and this cuticle creme is no exception. It smells divine and lemon zesty. It comes in a really cute handbag circular-shaped tin. It's quite thick in consistency and really easy to apply and rub into the cuticle. after using for a few weeks my cuticles started to feel stronger and look healthier. There's also something a bit therapeutic about taking time out of your day to do something for yourself. I love that it contains nearly all natural ingredients and supports our bees. Would definitely buy again when it runs out! Those with weaker nails/prone to breaking. As someone who does not normally fuss too much over her nails, receiving this as my beauty haul was a great choice - as it is a product that will last years and is delightful at first sight! Firstly, this product comes in a nice, vintage looking packaging and then the actual product comes in a tin, which is easy to unlid...then the actual product itself is a fragrant, lemon smelling, solid emollient, which melts on touch and glides on well to cuticles. As someone who often has dried, hardened cuticles this is a good find, and I was able to instantly push my cuticles back and improve the appearance of my nails. This cuticle cream will be twice as effective if you soak your hands prior to using it - and will make for much easier to manage cuticles. I used to work in a pet store and was washing my hands so much throughout the day that my nails were flaking and my cuticles were so dry. I decided to try this balm based on my love of other Burt's bees products and I was not disappointed. I cannot reccomended this product enough for people wanting to improve the health of their cuticles and nails. Within a week of using it I noticed a visible difference and I now use it a couple of times a week as routine nail care. Burt's butter lemon cuticle cream is amazing. I was a bit sceptical but am pleased with how it worked out. I love the citrus smell. Mmmmm it really is just gorgeous. The cream is easy to use and goes into your nails straight away. Didn't take long for my nails to see the benefits, making them smooth and stronger. Great for colder times when our nails split etc. It comes in a cute little tin and is quite economical to buy as it lasts a while. Be generous and put plenty on so it has a chance to work. This cuticle cream is very easy to use, and does what is promises to do. When I use it every day, or even every second day, before bed, my cuticles are soft and they look great! When I forget to use it for a while my cuticles harden and look awful. Its great for a short term fix, but won't repair them over the long term. For the price (approx. $15 for 17grams at Priceline) I do think it is a but much to pay for the amount you get, compared to other similar products, but the small size it great to fit in your handbag. Use everyday for the best results. It has a scrumptious citrus scent that i love (not sure if its to everyone's taste but i think its refreshing). The tin is ok, not sure if i like dipping my hands in, but you get used to it. I find a little goes a long way and so for that and the price, its great bang for your buck. This product does a great job at helping my dry, brittle nails. The smell is so delicious, and I love the texture, it’s creamy and balmy, but it’s not too thick like paw paw cream. The tin can be a bit annoying to open but I don’t mind too much. This product really works, but you have to use regularly for long lasting results. Overall, it’s a great product and I would recommend it to anyone who wants to up their nail care routine. I was very lucky to purchase this cream in a Xmas gift pack and a first time user of this product. This came in an 8.5gm flat tin and for a small item this packs a punch . The first thing I noticed was the lemony scent which smells delicious and think it would be great in a lipbalm. Upon opening , you have to take a bit of care as the tin is flat and found it a little hard to twist the lid, so perhaps the packaging can be put in a tube instead and prevents finger dipping . The cream is quite intensive ( resembles more of a light balm ) but is not sticky and used a small amount for my hands , nails and even tried it on my toes . My nails have always been brittle and dry to a point where sometimes skin flakes around the cuticles and instantly it made by skin soft, moist and cuticles shiny and smooth. It absorbs very well and due to my dry skin , it would be perfect during the winter seasons . Having said this I wouldn't recommend if you have oily skin as the intensity of the cream might be too much on the skin. Another great quality product from B/Bees. Use small amount as it is intensive . Being a longterm nail biter until quite recently, I've never been one to invest in nail care products, however during a trip to Myer last year I was talked into buying this cuticle cream. Initially I thought I would only use this as it smells so good (lemony and tart and zesty) but I ended up noticing a huge difference when I neglected to put it on. The texture of this is really lovely. It's definitely a balm, not a cream. It's really thick and emollient and applies nicely to the skin. You do need to give it some time to sink in, or wipe the excess off, as it can smudge and transfer onto things you touch. It leaves my nails and cuticles feeling really soft and hydrated, and the smell lingers for such a long time. I've had compliments on the smell whenever I wear this to work. Long term, I feel like this has had a really good effect on my nails. Now that I have managed to grow them out, the skin around my nails is soft and supple and my nails look beautiful and well cared for. The packaging isn't the best, it can be quite hard to get out when you have long-ish nails but the tub lasts for ages. I'll definitely be purchasing another one when I run out. First of all I think the packaging is super cute being a little round tin. The lemon scent is nice and the balm has a subtle yellow colour. The actual product is really nice on the nails. It is very thick and ointment-like and is therefore very heavy duty which is perfect for the cuticles. After applying this, you do have to let it sink into the skin for a little as it can be quite sticky. Massage the product into your cuticles during application. Anyone wanting to take care of the health of their nails. This cuticle butter is literally so good you could almost eat it! I received this in a hand care pack and it is by far the star. Simply rub it on your cuticles and for the best result leave it to sit for a bit. The butter will soften cuticles enough to then push them back to leave the nail bed looking well taken care of. The lemon scent is just gorgeous. It's fresh and leaves your hands smelling fresh. This is burts bees cuticle cream is actually a really thick balm and not a cream. It comes in a cute slim round tin that is easy to carry in your make up bag. It has a very strong lemony smell to it which I like but it could be a bit over powering for some. I tried rubbing my finger in it to get some of the balm out but I couldn't get much out so I scraped it out with the back of my nail and that worked perfectly. I then melted it in between my fingers and applied it to my cuticles and nails. I absolutely loved how it felt on, so smooth and creamy, absorbed better then I expected. I've used plenty of cuticle creams while I was studying manicuring and have to say this is the best I've ever used, a must have. Wow, where do I start? I was recommended this product by one of my friends who said she swore by it. I was a little hesitant at first because of the price for the size, but it makes up for the miracles it performs. I personally have very dry and flaky cuticles which peel if not taken care of. I'm also a person who likes to fidget, a lot. Next thing you know, the skin around my nails is raw and stinging. So, when I first latched onto this product I was in desperate need of a fix for the poor condition of my cuticles. The product has more of a balmy consistency than creamy which for me, felt nicer to apply. After I rubbed it into my cuticles and nails I was completely in awe at how quickly it made a difference, practically within a few hours. A week passed and my cuticles have never looked better. No flaky or peeling skin and I've also noticed that my nails have strengthened just by a bit. I happily continue to use this holy grail product which I religiously use every night before I get into bed. Not only is the balm itself amazing, it comes along with a nice, mild lemony scent that is actually quite refreshing. And a convenient little pot that fits nicely in my handbag or bedside table draw. Not to mention the stuff lasts for ages. When I finish the product I will definitely repurchase. I find applying the balm at night lets it soak into my fingers and nails so by the morning they're soft and moisturised. Dry cuticles and weak nails. The tin packaging is simple but effective to house the thick balm. The balm is easily melted by the heat of the skin. I applied a light layer on my cuticles during winter, when my skin is dry and parched. It helps to soothe the tight feeling of the dry cuticles and moisturise the skin. It does feel slightly sticky and oily when applied too much, but the sticky thick balm is the reason why the product is effective on dry, scaly skin. The balm also smells of fresh lemon, making it really pleasant to apply. Melt the balm with the heat of the fingers before applying, making it easier and smoother to go onto the skin. Once again, the 95% natural ingredients and environmentally friendly packaging had me. This product nourishes the cuticles with its lightweight formula. I love how portable the packaging is so I take it around with me when I'm travelling. It smells amazing (I love the scent of anything citrus) and a little bit goes a long way. I would not recommend applying this if you have any open wounds as the lemon oil might make it sting! Use it under your lip balm for extra hydration. This cuticle balm is perfect for softening the cuticle and nail in general, and also is great for winter if you happen to get dry cracked skin on or between the knuckles. The consistency is like a waxy balm but its really nourishing and sinks into the skin well. The product comes in a round tin with an illustration of a lemon on the lid. the tin design is so cute and the balm itself smells amazing, like real lemons! This product is perfect to nourish the nails and cuticles right after removing old nail polish. I noticed a big difference in the condition of my nails after using this, as there was no dryness or flaking of my nails that can occur after using a lot of nail polish remover. I got this balm in the smaller size in a set with the Burts Bees lip balm in pomegranate, which is also a great product from this brand. my nail love 101! hungry nails will die for this! Burts bees cuticle cream is the best product for nails ever I have not went back after so long now wouldn't change!! As soon as you open the little tin you are hit with a strong beautiful lemon scent the cream is more like a balm in which you apply a small amount to the cuticles. harder with long nails :) is thick but easy to rub in spread, soaking in immediately. Just after one use- overnight/24hours my cuticles are almost heeled / soft skin The cuticles are left soft and smooth. This really helps my dry flaky nails get stronger too. an help grow quicker. The best bit is that you can use this on the feet too and it will get rid of the dry bits too. this product is a must have & I will continue to use. my review is like so many so u know its right for u!! A little bit of product goes a long way hate the tin its hard to open they need fix it. any nails needing a feed! Even though Burt's Bees Lemon Butter Cuticle Cream is a good quality product, there are reasons why I prefer using a cuticle oil . It has to do mainly with the length of my nails and Burt's Bees Lemon Butter Cuticle Cream packaging. For a person who has long nails like mine which extend at least 5mm beyond the tip of the finger, this product is not very easy to use. The product, a solid cuticle cream, is packaged in a narrow edged, flat circular metal tin whose corresponding metal lid fits very snugly over it. There is a raised metal rim to the lid that aids in the lid's removal. Because the lid fits so snugly on the container, it cannot be removed in a single movement. I hold the small tin between the fingers of both hands and pry the lid open with the sides of my thumbs. People with short nails would most likely use the edges of their nails or the tips of their fingers to pry open this tin but having long nails makes this difficult. I won't use my nails as it would most likely damage them so opening this tin this a slow and careful process. One slip and I could easily crack or break a nail. Once the tin is open, the product is usually removed with the tips of the fingers. Again, having long fingernails means the likelihood of digging my nails into the product is highly probable. This makes usage rather messy as cuticle cream will get under my nails. The cuticle cream does have a lively fragrance of lemons and it does moisturise the cuticles well but it does leave my fingers feeling as if there is a thick , waxy coat of grease on them. Also, I find that using a cuticle oil gets my nails in good condition far quicker than using this product. Given the choice, I would choose a cuticle oil over this cuticle cream because it is so much quicker and easier to brush on the cuticle oil onto my cuticles. Also, there is little chance that I would break a nail unscrewing the top of a nail polish shaped bottle than prying open a narrow edged tin. One may say that Burt's Bees Lemon Butter Cuticle Cream is convenient to pop into a handbag as there is no chance of spillage but cuticle oils can now be purchased packaged as a cuticle oil pen too. In fact, this design of packaging , in my opinion, is the best design for convenience and use. 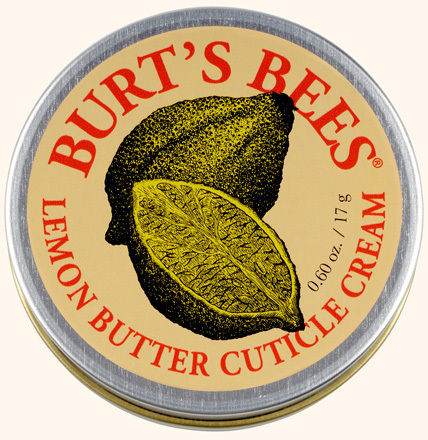 Burt's Bee's Lemon Butter Cuticle Cream is a good cuticle moisturiser but I would recommend its use for persons with short fingernails. Don't try to open this product if you have long nails. Ask your husband/partner to do it. Ideal for people who tend to keep their fingernails short. This cuticle balm definitely lives up to the hype. Not only has it become somewhat 'cult' but it's got a price point to boot at around $15 AUS. At first opening you instantly get a wiff of the signature lemon scent, but it's not to the point of over powering. The balm itself is soft and pliable and when used with the right hand cream does wonders for the skin. When applying to the cuticles a little goes a long way as it melts in quite easily and doesn't feel greasy after application. Since purchasing this a few weeks ago I have been using it every day, sometimes twice and I have seen the improvement and benefit it has had. A winner in my books and highly recommended! All skins types.  Burts bees is reknowned for its natural ingredient base. Well manicured for less money? Yes please! What do your nails really need? bh lists the foods that help to keep your nails long, strong and healthy. Are you sick of looking at torn, damaged cuticles? bh explains how to deal with them. This year marks the 30th birthday of one of our favourite all-natural beauty brands, Burt's Bees. Find out some fun facts about the brand, plus their most popular products!